Quarterback Reece Udinski completed nine of 13 passes for 112 yards and three touchdowns as VMI conducted its second controlled scrimmage of fall camp Saturday afternoon. Moved to the turf Fiorini Field practice facility because of wet conditions at Foster Stadium, Saturday’s scrimmage lasted an hour and 15 minutes and 86 plays were run. The offense set the tone early when Udinski reeled of six consecutive completions in his first six attempts including a 26-yard scoring strike to junior wideout Javeon Lara to cap the first drive. The VMI receivers were active throughout the afternoon as a dozen wideouts caught as least one pass among four VMI quarterbacks. The defense also stepped up to make plays as freshman defensive tackle Warren Dabney pounced on a fumbled ball to abruptly halt the ninth scrimmage possession. Sophomore Chris Ferrill broke up a pass in the right corner of the endzone to end another scoring threat and safety A.J. Smith delivered key hits throughout the afternoon. Linebackers Tyren Cloyd (2 TFL, 1 Sack) and Liam Kauthen (2 TFL) also had active scrimmages. Other offensive highlights included freshman quarterback Chance Neuman threading a 12-yard TD pass to redshirt junior Jake Paladino midway through the workout and redshirt sophomore running back Alex Ramsey carrying five times for 27 yards including a scrimmage long 15-yarder. 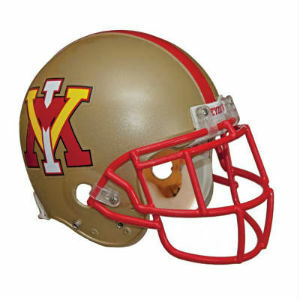 The Keydets worked a number of situations typical of preseason scrimmages to sharpen execution on both sides of the ball. The Keydets will conduct Sunday meetings but take a break from drills before resuming practice Monday at 9:15 am at Fiorini Field.